The U.S. Drought Monitor is produced in partnership between the National Drought Mitigation Center at the University of Nebraska-Lincoln, the United States Department of Agriculture, and the National Oceanic and Atmospheric Administration. The U.S. Drought Monitor (USDM) is a weekly product that provides a general summary of current drought conditions. Multiple drought indicators, including various indices, outlooks, field reports, and news accounts are reviewed and synthesized. In addition, numerous experts from agencies and offices across the country are consulted. The U.S. 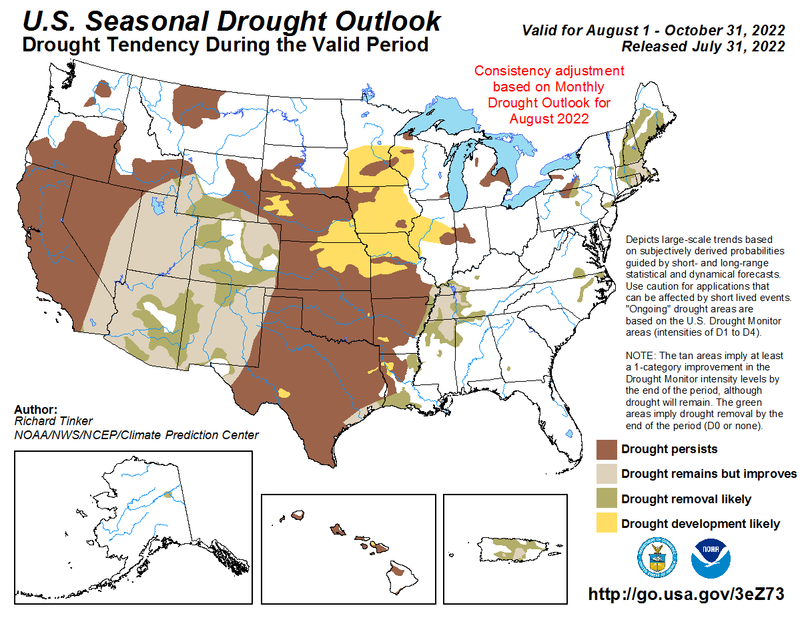 Seasonal Drought Outlook shows predicted trends for areas currently in drought, as well as areas where new droughts may develop. The NOAA Climate Prediction Center issues this monthly product in conjunction with their long-lead temperature and precipitation outlooks on the first and third Thursday of each month and when weather events warrant an interim update. The general large-scale trends depicted are based on numerous indicators, including short and long-range forecasts.